"This is a delicious, subtly blended melange of flavors. 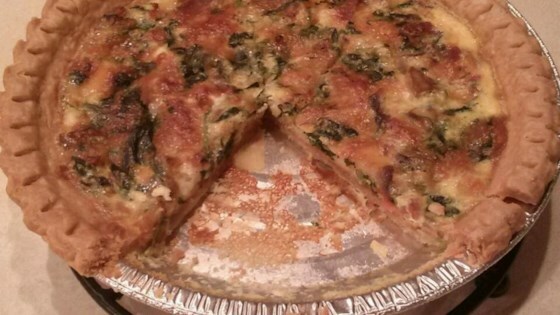 This quiche is filling, satisfying, and oh-so-good! Serve warm with a chilled bottle of white wine or white zinfandel and a cool vinaigrette salad with avocado. Enjoy!" Whisk together eggs, milk, blue cheese dressing, and cornstarch in a bowl until smooth. Fold in spinach, tuna, bacon, and Swiss cheese until evenly mixed. Pour into pie shell. Bake in preheated oven until a knife inserted into the center comes out clean, 30 to 35 minutes. The quiche was ok. I believe it would have had a better flavor without the blue cheese. Writing my first review - and thank you Ms Kitti for a unique and delicious recipe! My picky husband said it was really good and had 3 servings!! That's a first. This was outstanding!Easy to make, a great way to use tuna, and a wonderful flavor!